Enjoying summer evenings with the flickering glow of natural flame ambiance has never been easier than with the TIKI Brand Beacon 2-in-1 Torch. This contemporary take on the classic outdoor metal lantern features a round glass fuel vessel and an integrated metal snuffer to keep it looking good day or night. The versatile four-piece pole allows you to use it as a full-sized 65-in. torch, or a 50-inch garden torch. 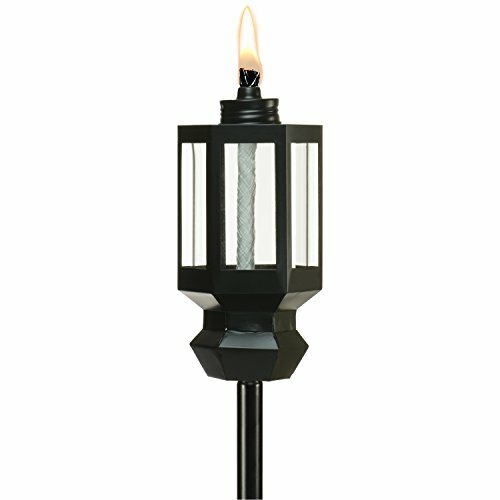 This durable metal lantern is an attractive addition to any backyard space. Use with TIKI Brand Bite Fighter Fuel and enjoy proven mosquito repellency and up to five hours of burn time with each 12-oz. fill. The TIKI Brand Beacon 2-in-1 Torch comes complete with, four-piece pole, long-lasting wick, and an integrated metal snuffer to safely extinguish the flame when the party's over. TIKI Brand Bite Fighter Torch Fuel sold separately.